Bevel cutting 45 degrees left and 5 degrees right. - Available for cutting 203mm(8") crown molding leaning against fence. - Available for cutting 165mm(6-1/2") base board with standing. - Sturdy structure by using 4 slide poles. - Smooth and accurate cut by 6 liner ball bearings. even in bevel cutting or cutting decorative timbers. - Self-aligning center plates on the guide fence for less splintering. 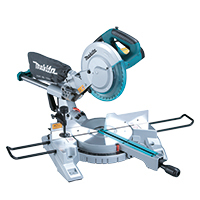 - Large cutting capacity with 355mm (14") blade. - Dimensions (L x W x H) 596 x 530 x435mm (23-1/2" x 20-7/8"